Mercer Island, with only two homes priced below $1 million, struggles with the lack of affordability at mainstream price points. While the number of $1-2 million homes for sale is up sharply (46%), finally giving buyers more options to choose from, the pace of sales in that price point has cooled off as buyers wait for the perfect home. A glut of homes for sale in the $3-5 million range—up 67% over this time last year—has caused that segment of the market to stagnate. Homes in the $2-3 million and $5 million plus ranges have fared slightly better than their middle sibling. 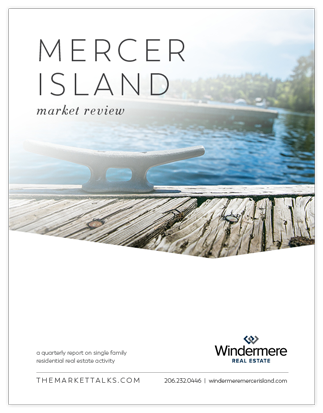 Mercer Island condos, the only affordable option on the Island, have soared in value with recent sale prices creating shock waves within the industry.